Mache answers the quail call. In the 90s animated series Doug, the quirky teen often imagined himself as a superhero named Quailman. His "costume" was the usual green sweater vest, white t-shirt and khaki shorts, but with a belt wrapped around his head and a pair of tighy-whities worn on the outside. There's been little reason to ever expect a Quailman sneaker for the past 20+ years, but customizer Mache is known for delivering the unexpected. His latest project sees the Nike Air Force 1 High get a makeover inspired by Doug Funnie's alter-ego. The colorblocking is pulled from Quailman's attire and tablecloth cape. Representing Doug's actual sneakers, the toebox has been left white, while the tongues have been reconstructed in khaki fabric as a nod to his shorts. Fruit of the Loom branding filling the Swooshes is symbolic of the aforementioned underwear and a leather belt strap replaces the usual Air Force 1 strap. 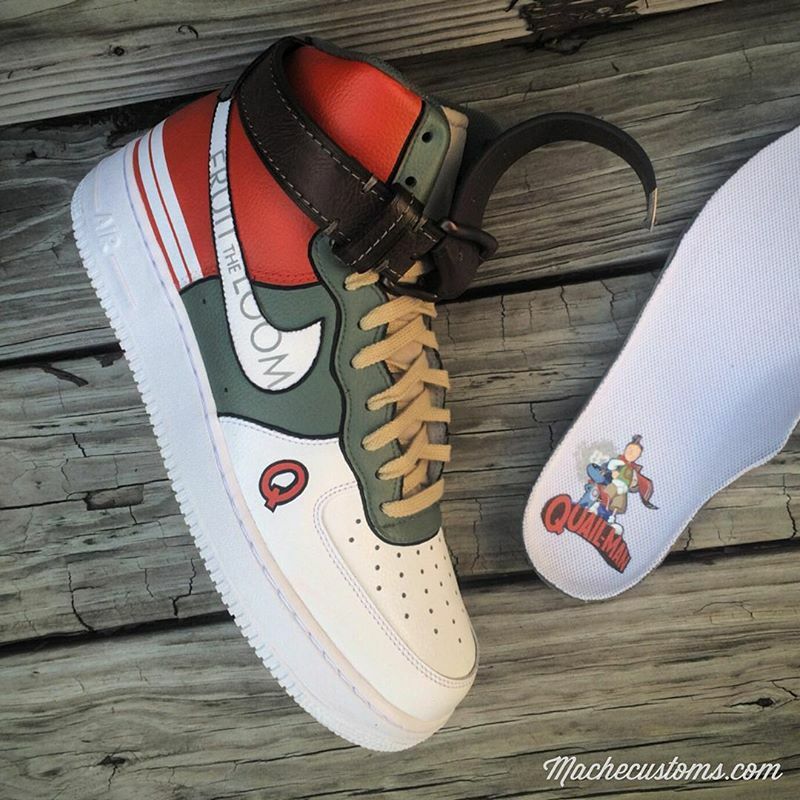 Between this shoe and his Toy Story-themed customs, no one could ever say Mache lacks creativity.